Noaa predicts third-ever global bleaching event could cause a 6% global reduction in coral reefs in less than two years. A massive coral bleaching event currently ravaging coral reefs across the globe could destroy thousands of square kilometres of coral cover forever, US government scientists have said. In figures exclusively released to the Guardian, scientists from the US National Oceanic and Atmospheric Administration (Noaa) said about 12% of the world’s reefs have suffered bleaching in the last year. Just under half of these, an area of 12,000 sq km of coral, may be lost forever. Is the Guardian is telling the truth? Is NOAA secretly giving exclusive results to a foreign newspaper before releasing them to the taxpayers who paid for them? The “Coral Reef Watch” section of NOAA is credited with being the ones responsible for this underhanded action. Is this true? And if so … what on earth are you people thinking of? That would be a blatant misuse of your authority, knowledge and power. In any case, I call on you to immediately release whatever secret exclusive results the Guardian is referring to. They are using it to alarm the populace WITHOUT ALLOWING US TO INSPECT THE DATA, and you are complicit in their action. I request that you send me by immediate email a copy of the exact results the article is referring to, and I call on you to publicly declare an end to such underhanded secret release of data. The Guardian is noted for its fire-brand alarmist climate rhetoric. And that’s fine for them, but you, on the other hand, are alleged to be scientists. So I ask you to act as scientists, to permanently eschew such “exclusively released” figures, and to state publicly that in future your results will be available to all, rather than secretly given to your favored journalists. PS—Please be aware that I have raised the issue publicly [with link to this post]. You'll notice a few things. First he took it for granted that he wasn't addressing a woman at the NOAA and didn't write in his normal suave style. Then you'll notice he called the Guardian a magazine. Perhaps that's all that he knows and he's never heard of a newspaper, which is after all a very old-fashioned concept not suited to the age of the internet. Shouting is a nice touch, too isn't it. It shows that no-one messeth with Wondering Willis and gets away with it. Now Willis isn't one for doing research himself. He likes to be handed stuff on a platter. 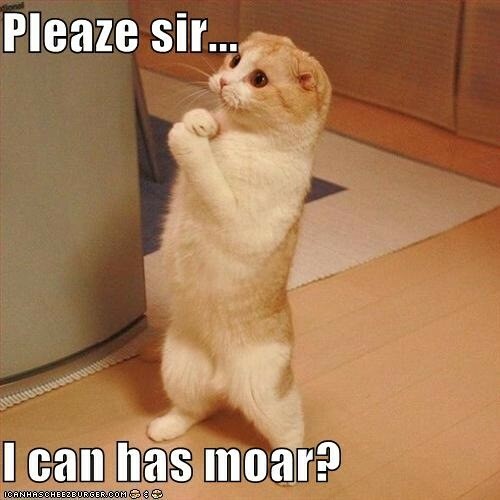 And he demands, no requests, that he be served before anyone else. He is top dog in the US of A. Everyone knows that. And coral reefs are a hot topic at WUWT. There must be an article about them at least once every five years or so. Me? Well I decided to do some checking. It wasn't hard. Google was my friend. Here, let me show you. With the seasonal progression of the sun to the northern hemisphere, surface water temperatures in the South Pacific have cooled a bit, bringing relief to South Pacific corals. A full-fledged global bleaching event continues to be likely. Warming in the equatorial Indian Ocean has caused bleaching in the British Indian Ocean Territory and the Maldives. Warming also has begun in the Caribbean, with extensive bleaching watches and some warnings present along the southwestern Caribbean coasts. The declared El Niño continues to build with both Kelvin waves propagating from the west into the eastern Pacific and wind shifts that further strengthen and maintain the El Niño. This El Niño is likely to further exacerbate anomalously warm waters off the U.S. west coast. Coral Reef Watch (CRW) continues to expect another global-scale bleaching in 2015 but hopefully not as severe as the 2010 event. However, some locations may suffer worse bleaching this year than in the past, just as we saw record thermal stress in the northernmost Mariana Islands and the Northwestern Hawaiian Islands in 2014. 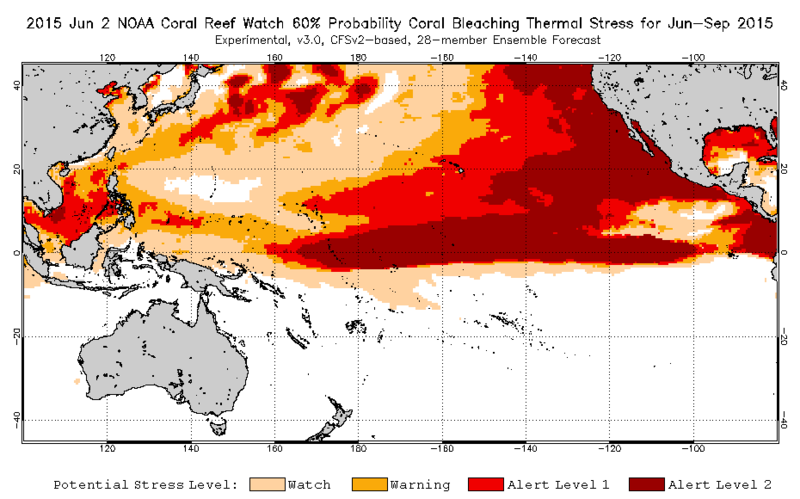 Our greatest current concern is the upcoming Caribbean bleaching season, although some unusual developments are appearing in the Four-Month Coral Bleaching Thermal Stress Outlook, including the potential of bleaching again this year in Hawai'i. As unusually warm ocean temperatures cover the north Pacific, equatorial Pacific, and western Atlantic oceans, NOAA scientists expect greater bleaching of corals on Northern Hemisphere reefs through October, potentially leading to the death of corals over a wide area and affecting the long-term supply of fish and shellfish. While corals can recover from mild bleaching, severe or long-term bleaching kills corals. Even if corals recover, they are more susceptible to disease. Once corals die, it usually takes decades for the reef to recover -- but recovery is only possible if the reefs are undisturbed. After corals die, reefs degrade and the structures corals build are eroded away, providing less shoreline protection and less habitat for fish and shellfish. You can read the rest here on the NOAA website. You can learn a bit about coral bleaching from the Great Barrier Reef Marine Park Authority website. Thing is, that coral bleaching has been in the news rather a lot lately, though you'd never know that if you only read articles at WUWT. Perhaps that's the reason why Willis is wondering how he missed out on reading about it. Is the Guardian is telling the truth? blatant misuse of your authority, knowledge and power. Then the obsequious "my regards to you" followed by the earth-shattering threat that must have left NOAA shaking in its multiple boots (or flippers, given the setting) - not! Wow they’ve really streamlined the alarmist propaganda pipeline, they now bypass all other media outlets and go straight to the Communist Chairman of lefty lie rags ‘the Guardian’. Is the Guardian telling the truth? The Guardian wouldn’t recognise ‘the truth’ if if came up and bit them on the arse! It’s hilarious…they STILL can’t bring themselves to admit that they were wrong about the Euro! Members of the Executive Branch of our federal government no longer consider themselves “servants of the people”. Better guard that lip, Willis. Antagonizing your masters is rift with onerous consequences. With AGW having been declared “a national security issue”, lose lips could sink ships (of State). The highest court in my State has ruled that (to put it politely) misrepresentation is acceptable exercise of free speech in politics. I am thinking that it is equally possible that the Guardian just made the NOAA release up. These people are ideologues, they know that the truth in politics is what the people believe and has no necessary linkage to reality. That game plan is why these people are so creative and effective.. The Guardian claims it got exclusive data from NOAA, but given its history of miniscule acquaintance with the truth, how do you know IT isn’t making this up too? I hope you sent a similar letter to the Guardian asking for clarification. "In the British magazine The Guardian"
That would be daily newspaper. If he can't get that right, the harder bits will be beyond him. Mark has been tweeting about this for a while now (@MarkEakinCRW), way before that press release. I'm trying to figure out what was so exclusive about the story, but maybe its just that things have been so busy on the climate beat that the Graun was the first to publish something. And a thorough, well-written something it was, too. Re Willis, the phrase "savaged by a dead sheep" recommends itself. Also, the Graun is a tri-national publication these days, very much including the U.S., and Karl Mathiesen seems to be an Aussie (a UTAS graduate, anyway). Steve, does that mean I should forgive Karl for talking to Ove without consulting me first? Indeed Oz punches greatly above its weight, IIRC with only Switzerland able to make a similar claim. Hopefully that status will survive the present government. The letter makes a lot more sense when you realise it was tailored to be read by the nutters at WUWT rather than by anyone who is sensible. It is almost as if Willis has been unaware of the threat posed to coral reefs by temperature and pH shifts and now finds himself so frightened that he has to blame somebody for keeping him in ignorance. Willis, if you are reading this then go find out about red tides in the oceans, green algal blooms in the North American lakes, the increasing areas of oceanic dead zones and the class of organisms that are flourishing and threaten not only fisheries but coastal power generation infrastructure and has even crippled a US supercarrier the USS Ronald Reagan CVN-76 (there is a certain irony in that name). Willis, you may also like to consider the spread of invasive species by humans. Take the curse of the Asian Carp in US waterways introduced to clean up water in treatment plants. Nobody, it would appear, thought to consider what would happen in the case of flooding. Lomborgists should consider the law of unintended consequences when it comes to bioengineering and geoengineering. Lionel, I was curious about what you said regarding the USS RR - CVN-76, but couldn't find anything searching the internet. What are you referring to and do you have any sources to share? "In 2006, jellyfish took out the USS Ronald Reagan after they were sucked into the aircraft carrier’s nuclear reactor cooling system while it was docked in Brisbane, Australia." Oh that class of organisms! Yes sir, plenty of stuff to find there. Why Dangerous Jellyfish Are Washing Up In N.J.
Jellyfish: Are They Taking Over In Sick Oceans? "Lisa-ann Gershwin sees evidence of global warming and human impact on the environment everyday in her work. She is one of a handful of jellyfish experts in the world. Her research shows that a booming jellyfish population is displacing penguins in Antarctica, crashing world fisheries, possibly starving the whales to extinction, gumming up nuclear power plants, even bringing down national economies. That’s because jellyfish thrive in the warmer, less-oxygenated water in many of the world’s oceans." Sorry CC, I was not explicit enough in specifying the species that is taking over oceans as a result of our activities. I was writing as if Willis was reading and would be prompted to discover more for himself. The dominoes are falling and most do not even know what the dominoes are. Invasive species such as the kissing bug moving up into north America, foreign species such as the Burmese python eating the heart out of the Florida Everglades, introduced for pets and dumped when they get too big. Humans really are stupid. "... it in fact takes years before the bulk of humanity even realise that their world has been invaded." No need for apologies, in fact, thank you for inspiring me to hunt around and catching up on recent jellyfish news… and giving me an excuse to share that above info. By the way Craig Welch's Seattle Times series is excellent if you haven't read it (http://citizenschallenge.blogspot.com/2014/04/ocean-acidification-already-eating-away.html :) . I wasn't familiar with Lisa-ann Gershwin, so that was a bonus. CC, Gershwin is an interesting and larger-than-life person. She's ebulliantly passionate about her subjects but also very blunt about the effect that they can (and will...) have on ocean ecosystem composition. Her work is definitely worth chasing up, and especially her book Stung!. Could we have an arrested development ranking for these cats, Please? Charles Nelson doesn't know what he's talking about either. GS sold them on a scam just like they sold everybody in the USA a scam by rolling back Glass-Steagall and installing the Commodity Futures Modernization Act among other things, so he's pointing fingers? Ha ha... It's a mafia style conquest. And the mafia sure as hell wants Russia too. The markets are seesawing as much as the weather is. You cannot run an engine without oil or greece. Remember when Willis would recount his menage-a-trois (and more) exploits from the late 1960's in his earlier WUWT posts? Is Willis just a case of performance art ? Everything Willis writes is cringe-inducing. But that is what sells for the horror-movie crowd.